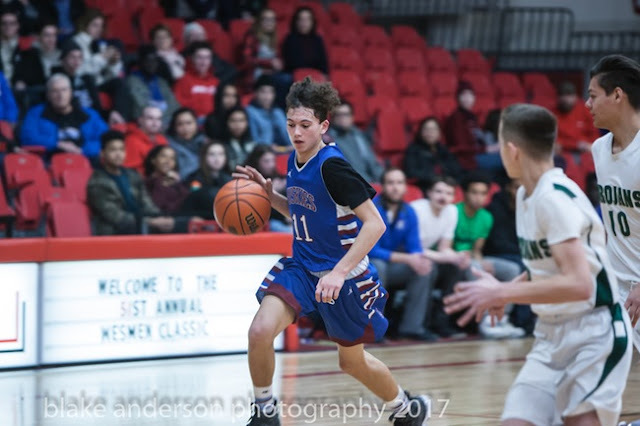 The Sturgeon Heights Huskies didn't trail for a second, and rolled to the championship in the JV boys basketball portion of the Wesmen Classic on Wednesday. Mason Kraus scored 24 points and was named tournament MVP as the Huskies cruised to a 76-44 win over the Vincent Massey Trojans at the David F. Anderson Gymnasium inside the Duckworth Centre. Kraus had 22 points at the half, 15 of those coming in the first quarter, when the Huskies did irreparable damage, breaking out to a 12-3 game-opening run and never looking back. Sturgeon Heights led 30-14 after the first quarter and took a 50-21 lead into halftime. Kraus averaged 18.3 points per game over the course of the tournament. Tournament all-star Jesse Fedak added 10 points for the Huskies, who also got 14 points from Kobe Burkett and 13 points from Logan Kraus. Dominik Riffel had eight points to lead the Trojans. Riffel and teammate Lota Offor were named tournament all-stars, as were St. Paul's Jonam Kazadi and Fort Richmond's Tito Obasoto. The JV event was a carryover from the 50-year run of basketball at the Wesmen Classic. The first-ever men's volleyball event starts Thursday at 5 p.m.